We know that variety is the spice of life and the same applies for exercise! It’s great to have some choice – if you can choose the piece of equipment you feel like using, you’re much more likely to exercise. 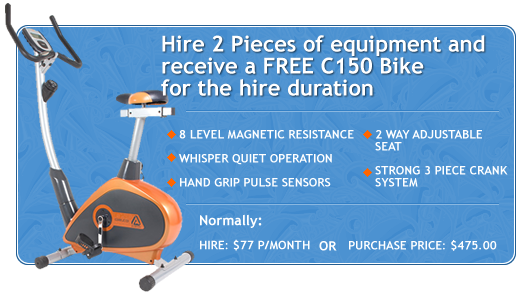 So, we’ve put together this terrific deal – hire 2 pieces of equipment and receive a free C150 bike for the hire duration! Come into the store (cnr Collins and Argyle Sts, Hobart) or give us a ring on 03 6234 1244 for more information.